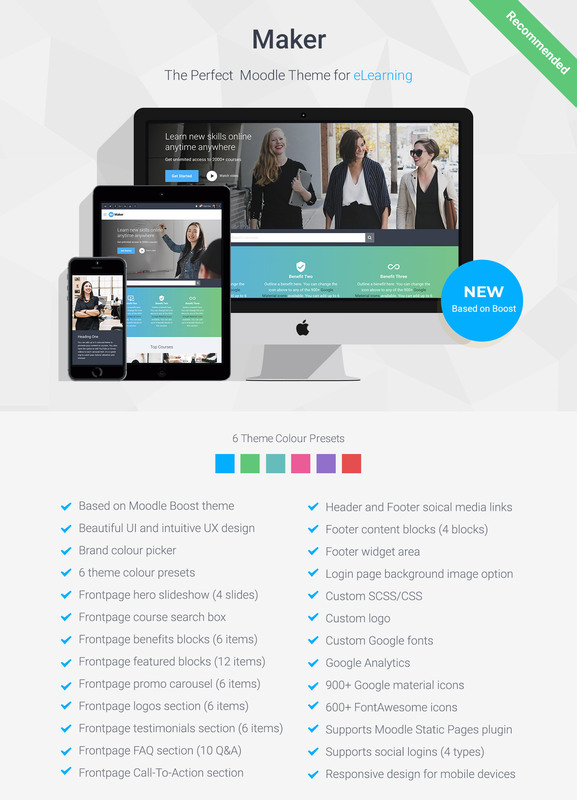 Maker is a responsive Moodle theme based on Boost. It’s packed with all of the features you need to transform your Moodle into the perfect learning platform. It comes with 6 theme colour presets but you can also easily pick your own colours to suit your site’s branding via theme settings. Built based on Moodle’s latest core theme Boost meaning it gets the best user experience out of Moodle. Made with outstanding UI design, it will take your learning platform to a new level. Check out the theme demo and our blog post about Maker’s main features to see what the theme can do for your site. If you are using this theme, please leave a review below! We’d love to see your Moodle site link if you want to share it. You might find this tutorial useful. How do I customise the theme to use my brand’s colour scheme? It’s super easy and we’ve got a tutorial for you. I need to completely customise the theme. Do you have documentation for it? Extract the /maker/ folder and the files. Updated the theme to work with Moodle’s latest security feature (Moodle 3.5.3+). Updated the theme to work with Moodle’s latest security feature (Moodle v3.4.6+). Added theme support for Moodle’s content filters.